Junk King makes the dumpster rental process as straightforward and simple as possible for our San Diego customers. If this is your first time using a roll-off container, you may not know what to expect. Think about how you can fill the dumpster efficiently and safely so that you’re ready to use it when the project kicks off. If you have any questions about the Junk King MINI dumpster or how to fill a dumpster efficiently, feel free to contact us for help from our San Diego dumpster rental experts! Being over-prepared can have its advantages. However, a dumpster rental that is significantly larger than you need will also cost a lot more. If you rent an extra large industrial container for a small home improvement project, you will pay the same price as if you filled the entire box. Some other San Diego dumpster rental companies advertise low rates, but those prices do not include delivery, pick-up, and other necessary services. Junk King makes things easy to understand with simple pricing and terms written in plain language. Minimize the number of steps between your work area and the dumpster location and you can save yourself a ton of time and effort! Dumpster rental may cost a bit more if you have objects sitting above the top of the box. Break down boxes, furniture, or other junk if possible so you can get more in the container without unnecessary overflow. Get a dumpster with a side door. This way you can walk in and set down bulky items rather than tossing them in haphazardly. In general, bulkier items go on bottom. However, anything that crushes easily can go on bottom. It’s okay to be messy! Use a sledge hammer or other tools to break down junk. Renovating? Leave room for scraps and trash. Pack the dumpster efficiently while loading it up with demolition debris. Home improvement and construction projects produce more trash in the form of leftover materials and other debris. Load carefully so you don’t have to re-organize. Depending on the type of junk you’re getting rid of, you may not want to climb in the dumpster after it’s been loaded. Take your time and figure out how to fit things in tightly. What Else Can You Throw Away? When you get a dumpster rental for a cleaning or remodeling project, use the opportunity to get rid of an old appliance, a broken recliner, or other junk you have sitting around. Our San Diego dumpster service can recycle or dispose of everything except hazardous waste. You also want to avoid overloading your dumpster with too much weight. Any dumpster rental service has a weight limit before you’ll be charged an overfill fee. Loading up heavy items like bricks or stone? Talk to the Junk King experts for help estimating the potential weight. Another thing to watch for would be a dumpster that damages your lawn, sidewalk, or driveway. We made sure the MINI dumpster is driveway-friendly for residential use in Southern California. With a footprint of about 8 feet wide by 12 feet long, it fits easily in a standard driveway. You’ll want to have your dumpster on-site as soon as your project begins producing debris. Wait too long, and you’ll have a mess at your feet! On the other hand, you might save a few dollars on daily service fees by minimizing the length of your dumpster rental. Most of our customers use their MINI dumpster for a period of 3 to 7 days. The best way to get the most out of your dumpster rental experience is to avoid overpaying. 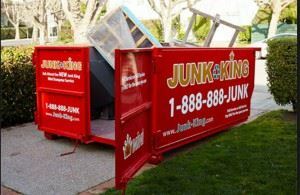 Junk King offers the first dumpster rental in San Diego with an option to pay only for the space you use. Only need to fill half the MINI? You’ll pay less! Check out our dumpster rental pricing and ask us any questions you may have about what to expect. Our award-winning customer service can help you along the way so you enjoy a safe and easy dumpster rental in the San Diego area. Call us at 619-376-2477 or book online now! This entry was posted in Uncategorized and tagged Dumpster Rentals vs. Junk Pick Up In San Diego, junk king san diego, junk removal on July 3, 2017 by Julian Torres, "JT". Last updated July 3, 2017 .